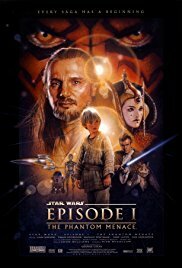 A couple of Jedi are sent to help the queen of Naboo whose planet is under seige by the Trade Federation, and with some difficulty they escape in her transport which is forced to land on the planet of Tatooine so that they can purchase spare parts; there they gain the assistance of a nine year old slave Anakin Skywalker, and after the boy wins a pod race obtain the spares for the ship allowing them to move on. Unable to overcome problems in the senate the queen and the Jedi, with the assistance of the Gungan people take on the battle droids controlled by the Sith, the blockading warships operated by the Trade Federation and the evil light sabre warrior Darth Maul. The Jedi fight with their light sabres, the Gungan underwater city is visited (with some fun action by very large aquatic creatures), quite a time spent in the Senate with the participants floating about when they speak, the pod race, which is pretty famous and the interaction with the flying owner of the junk yard. Random acitivities to provide views of the different races in the “galaxy far away”, dogfights between the space craft, the Jedi take Anakin under their wing against the advice of the Jedi council and finally major battles. A View I have never been a Star Wars fan, and this outing is at best “uneven”. Some of the set pieces were engaging, but the frequent need for exposition with accompanying speechifying was very boring. I liked the steam punk machines but the action lacked any sort of grit, something I believe they have recently tried to correct. Typically, although Anakin and his mother are slaves, they show no sighs of ill treatment, and the only serious injuries visible are those to the droids. Additional Info This very expensive and incredibly lengthy production may be most famous for the inclusion of the “comic” character Jar Jar Binks who was a disaster, but even so it eventually grossed over a billion dollars, and initiated two sequels.